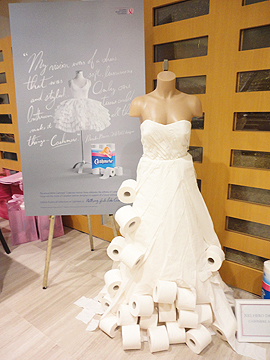 Now in its ninth year, the White Cashmere Collection was presented by Kruger Products and Cashmere Bathroom Tissue in the beautiful Arcadian Room at the Simpson Tower. 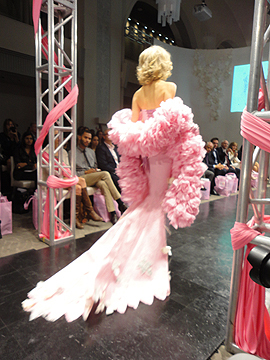 The luxurious show was showcased to support the Canadian Breast Cancer Foundation, in hopes of a future without breast cancer. Fifteen of Canada’s top designers crafted stunning gowns, jewelry, headpieces and, for the first time, footwear and children’s wear, all out of white and pink Cashmere Bathroom Tissue. Special guests for the event were Breast Cancer Survivor and Co-Host of Canada AM, Beverly Thompson, Corporate VP of Consumer Marketing at Kruger Products, Nancy Marcus and the fabulous Farley Chatto, who served as the Curator and Artistic Director. The White Cashmere Collection featured a talented roster of designers, all given the same task of constructing pieces styled around the “Classic Hollywood Glam” look, but individually crafted in completely unique and innovative ways. From bridal gowns, to red-carpet dresses fashioned with intricate headpieces, accessories and even shoes, this soft and luxurious collection is sure sign that you can overcome any challenge. 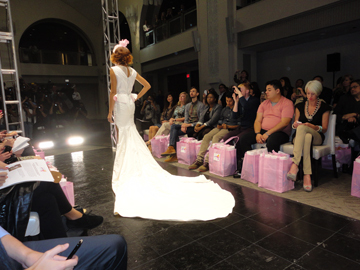 The 2012 collection was a breathtaking showcase of remarkable designs, used to show the support the fashion industry support for the Breast Cancer Foundation. 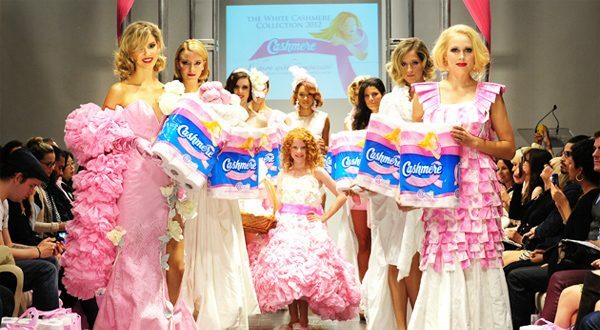 For every limited-edition pink Cashmere Bathroom Tissue package sold throughout the month of October, 25 cents goes to research for the cure. To vote for your favourite design, visit Facebook.com/Cashmere. For every vote, Cashmere will donate $1 (up to $10,000) in the winning designer’s name to the Breast Cancer Foundation.